= Acanthocalycium thionanthum var. munitum (Rausch) J.G.Lamb. 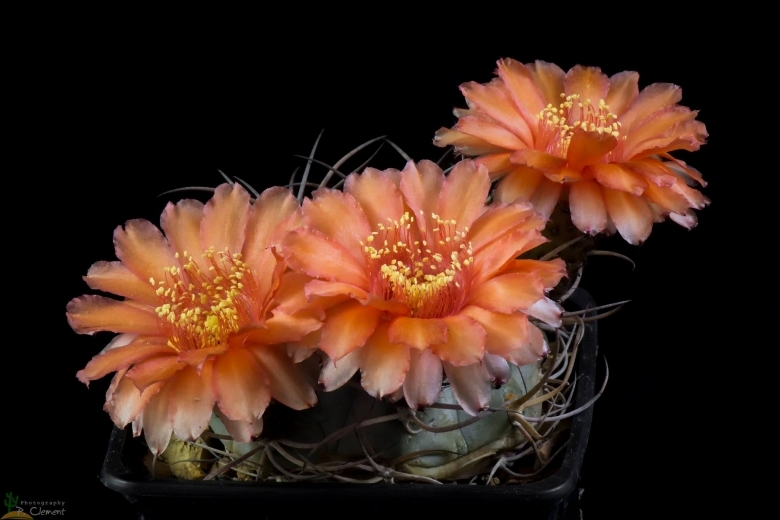 Description: Acanthocalycium thionanthum var. munitum is a local or morphological form of the widespread and variable Acanthocalycium thionanthum (Echinopsis thionantha). The var. munitum differs from the type variety mainly for its fabulous dark orange flowers, but yellow or red flowers have also been referred. The var. munitum is distinguish from var. variiflora (Backbg.) for the longer, harder and curved spines and for the slightly smaller flowers. (var. variiflora is a bit larger in size and the flower are more open and variable in colour). However in habitat there is a gradual series of transitional forms intergrading one into another, and it is almost impossible to tell them apart, if not for the geographical provenance, so now they are all synonymized with Echinopsis thionantha. Moreover the name “minutum” (instead of “munitum”) is often used among growers, creating some confusion. Stem. Usually solitary, rarely with two or more bodies, round to about 8-10 cm in diameter, and 15-20 cm tall, pale to dark grey-green, glaucous, with a carrot-like central root. Spines: About 9, up to 5 cm long curved and intertwined, larger at base, brownish with darker tip. Flower: About 5 cm long and wide, yellow, orange to red.